Edinburgh Capitals have committed to another season of Elite League ice hockey after announcing changes to the club’s structure. Their parent company, Capitals Hockey Ltd, was liquidated in November, but since then, they hadn’t revealed anything about the club’s future going forward until now. The Capitals also announced there will be fan representation on the board, offering more transparency on how the club is run as they start to put things in place for next season following another campaign where they’ve, yet again, finished bottom of the table. In a statement, they also admitted there have been ‘mistakes’ at the club and that they hope the changes will help them “earn back trust from Edinburgh Capitals fans”. The statement read: “The club has spent the last few months working on a major change in structure which will help it develop and create a stronger future. This new structure is something that should have been put in place some time ago and there is no hiding the fact that mistakes have been made. “This new structure will see a major change in the management of the club as it rebuilds and will now be managed by the Edinburgh Capitals Board which will have investors and representatives, from several business areas and professions, who will meet on a monthly basis. “They have committed to a significant level of investment and are ready to begin implementing a robust business plan and stronger roster for next season and will include a member of the Edinburgh Capitals Supporters Club (appointed by the ECSC) as well as a Fan Representative (someone with no ties to the club in terms of volunteering or working). “These two board members would bring ideas and a different perspective to decisions and this new access will allow the Capitals to have far greater transparency in the way in which the club is run. It is the first step in earning back trust from Edinburgh Capitals fans. Scott Neil will remain at the club in a role as Head of Hockey Operations and will represent Edinburgh Capitals at Elite League Board meetings. The changes were announced after months of silence following the news the previous company, Capitals Hockey Ltd, had been wound up in a court in Northern Ireland, where it had been registered. 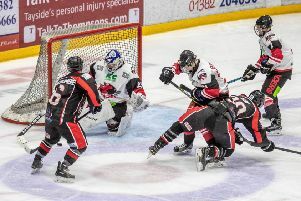 On the ice, the club have suffered as they failed to reach the play-offs again, finishing bottom of the league and, with two games to go this weekend, have picked up a meagre 11 points from their 52 games. Former NHL player Dmitri Khristich had been brought in as head coach, but left before Christmas as uncertainty surrounded the Murrayfield side, with Mike D’Orazio and Jock Hay acting as interim coaches since.